A revealing look at how a community evolved during two world wars, and as the popularity of the automobile altered lifestyles. 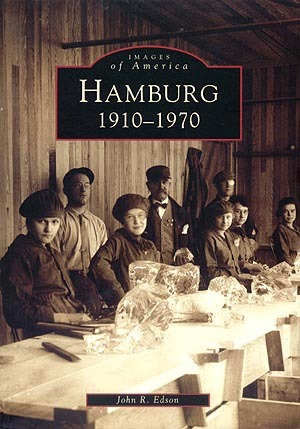 Using more than 200 archival photographs, author John R. Edson has penned a work that includes memorable stories from the past, lively tales that have shaped Hamburg's character. Readers will meet fascinating people like Broadway playwright George F. Abbott, who brought glamor to Hamburg, and Fred Weiss, the first police chief who had innovative ideas about criminal justice. Arcadia Publishing introduced the book as part of its Images of America series, hoping to play a role in preserving local heritage.